Is Hollywood Digging its own Grave? You probably have heard of the music band OK Go, which are well known for their amazing one-cut music videos. Some weeks ago they published their newest take, a marching band video to their latest track This Too Shall Pass. I watched the video, thought it’s amazing, wanted to blog about, but then learned that EMI prohibited viral marketing by not allowing embedding the video. It stirred quite a small tornado in the net. And I decided to not blog about the video because I don’t promote the stuff of guys who piss me off by thinking they’re acting smart. After that I didn’t bother anymore about it and so I totally missed the biggest news of them all regarding this matter: OK Go has decided to leave EMI and start their own label. I was all “WOW” for a second and read the news to get some details (which are cool to read, by the way, I really start to love the front man Damian Kulash). If someone’s gonna get to go make a three-minute movie, I wanna be the one having that fun! So in general, whenever we can do something ourselves, we do, because it also means that your career doesn’t ride on the ups and downs of somebody else’s marketing plan. And while I was reading that one thought slowly crawled up in my mind: could something similar happen to big Hollywood production studios in the near future? The best is to think of the good old windowing chain they started to implement in the 1930s: today it begins with cinema, then goes to DVD/BluRay and video rentals, then goes to payTV and finishes with FreeTV. And the start of this chain, cinema, is where Hollywood in my eyes started to dig their own graves some years ago. 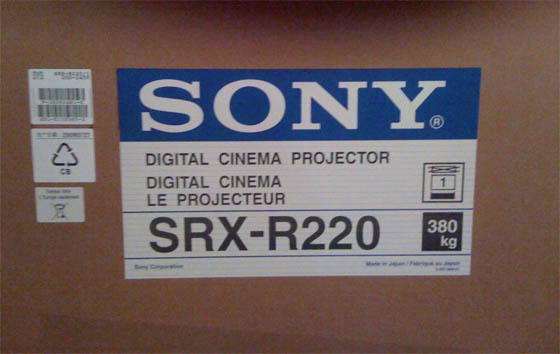 Because during the last years, Hollywood worked hard on digitizing your cinema of choice: Instead of the good old analogue projector we more and more get digital projectors, including Blue Pixels of Death. But when everything is digital, you don’t have massive copy costs anymore, a reason why Hollywood forces the new technology. But when there are no copy costs anyone could – theoretically – distribute his or her movie to cinema. Even small time studios and perhaps even normal people like you and me. You either need some cheap hard drives, or – even cheaper – provide your movie via internet, something Hollywood also works hard on to implement. I am sure that Hollywood put some neat tricks into those systems so this change won’t happen that easily. But I am also sure that it won’t take too long before – theoretically – anyone can distribute their movies to your cinema of choice. Thinking about it, this could also be a cool idea for small theaters to get new audiences and find new niches. They could present old classics or Grindhouse features, short movies from students, have competitions for digital experiments and so on. The possibilities are endless. The ironic part of everything will be the fact that Hollywood production studios themselves forced digital projection technology to cheapen everything – and so dug their own graves. Note: Cheaper = more can do it. Digital = even more can do it. Do the math and tell me if I am wrong.